This site is dedicated to "Hexcite" and other original games created by Gajin. Accordingly, we are planning to make demo versions of these games, as well as Java applets, available for free downloading. Download free trial version from Bigfish Games. "Hexcite Fusion" was released in U.S.A.
2004.2.16 SQUARE ENIX mobile site "Pocket Puzzle" starts for iMode(DoCoMo). There are over ten titles as "Rubiks Cube","Abalone","Hexcite ES",etc. 2003.11.20 SQUARE ENIX mobile site "Pocket Puzzle" starts for ezweb(KDDI). There are ten titles as "Rubiks Cube","Abalone","Hexcite ES",etc. 2003.11.12 SQUARE ENIX mobile site "Pocket Puzzle" starts for Vodafone live! There are 16 titles as "Rubiks Cube","Abalone","Hexcite ES",etc. 2002.12.4 "Brain Buster Series" for Windows ships from Sony Music Distribution (Japan) Inc. There are four titles as Gajin's games, "Sai Jong","Ballic","Kurulin Poker" and "Push Monster". The Master version is sold for 1050yen each. 2002.9.4 "Brain Buster Series" for Windows ships from Sony Music Distribution (Japan) Inc. There are four titles as Gajin's games, "Hexcite","Monopas","Locren" and "Chain". 2001.8.21 "REN"for Windows ships at VECTOR. 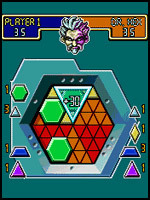 2001.5.10 "HEXCITE 2001"for Windows ships at VECTOR. 2001.5.10 "MONOOPA" for Windows ships at VECTOR. 2001.5.10 "LOCREN" for Windows ships at VECTOR. 2001.4.27 Space Hexcite for AGB ships from Jorudan Co.,Ltd. 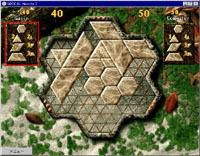 2000.7.21 The Glocal Hexcite for Windows ships. 2000.5.27 Glocal Hexcite for WonderSwan ships. 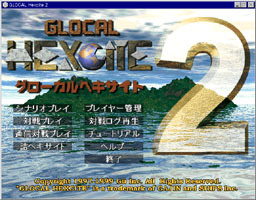 1999.9.24 Glocal Hexcite 2 for Windows ships, and with two CD-ROMs per package! Now you and a friend can play against one another over networks. GU,Inc. is seeking partners for commercialization of original games. Please click here for additional information if interested.